This End Times Deception Bible Study focused on the 7 kings mentioned in Revelation 17. Recently, I’ve noticed on Facebook that quite a few people are promoting a false view about the prophetic fulfillment of the 7 kings of Revelation 17, saying that it points to the last Popes of Rome. WorldsLastChance.com is promoting this concept and I see many Seventh Day Adventist’s also promoting it. To make their explanation work, they say that John was magically transported into the late 20th century, into a time when Pope John John II was leading the Roman Church, as the king who is. But the text does not say that John was transported into the future; it simply says that he was taken in the spirit into the wilderness. They say that Popes became kings in 1929 A.D.; that five Popes “are fallen” since then; that John Paul II was the King “that is“; that Pope Benedict was the 7th who ruled for a short time; and that Pope Francis is the 8th king. The 5th Pope, John Paul I, reigned for only 33 days, so that would have been the king who ruled for a short time, not the 7th who ruled for almost 8 years. The Lateran Treaty of 1929 A.D. recognized the Vatican as an independent state, but Popes have not been referred to as ‘kings’ since the treaty, so the whole premise of the explanation is flawed. Besides that, Popes have proclaimed to be king of heaven, earth and the underworld since the 12th century. The major flaw in their explanation is that all of Revelation is from John’s perspective, in the latter part of the 1st century. At that point in time, five kings would have fallen already, one existed at the time, a seventh would come and rule for a short time, and then the 8th would appear. So let’s look at the text and see what John is really telling us. In Revelation 17:1-6, John was shown that the Harlot Roman Catholic Church would rise to power out of the Roman Empire, that she would represent a revival of the Babylonian system of pagan god worship, and that she would be drunk with the blood of the saints. Of course this caused John to be in awe, as she pretended to be a Christian Church. The Roman Catholic Church rose to power in 538 A.D., shortly after the last Roman Emperor was removed from power in 476 A.D. So let’s look at what John is telling us. We already know that verses 1-6 are about the Roman Catholic Church, so the explanation in the next verses was given to help John understand who they were. Revelation 17:8 The beast that you saw was, and is not, and will ascend out of the bottomless pit and go to perdition. And those who dwell on the earth will marvel, whose names are not written in the Book of Life from the foundation of the world, when they see the beast that was, and is not, and yet is. The first beast of Daniel WAS Babylon, out of which came Satan’s pagan worship system which stole praise from the Father. They attempted to built a tower to the sky, as if to deny God. In John’s day, Babylon WAS NOT, for it had been overtaken by the Medo-Persian Empire, then Greece, then the Roman Empire. John had been shown that the Babylonian pagan religion was still alive and would manifest itself in the form of the Harlot Church. Roman Catholicism is really the pagan Babylonian religion of Sun and Satan worship, mysteriously masked by the cover of Christianity. The idols of Babylon became the idols of Rome, which were then given Christian names. John would have marveled at this grand deception of Satan coming in the name of Christ, so that people would worship a false Christ. The Jesuits, like the Babylonians, are pushing the world into a New World Order, where Satan will be exalted, where man will defy God. The antichrist beast, the Papal Church, will be judged and delivered unto perdition. Rome was the great power of John’s day, which is known for its seven hills (mountains) named Aventine, Caelian, Capitoline, Esquiline, Palatine, Quirinal and Viminal. Interestingly, an eighth hill, Vatican (Vaticanus) Hill, is located across the Tiber river from the traditional seven hills of Rome. After the papacy returned from Avignon, France, in the 1370’s, Vatican Hill became the headquarters for the papacy. It was the site of the Roman temple to the Great Mother Goddess Cybele, which had, and probably still does, house secret tunnels under where the Vatican is located, where the secret worship ceremonies of Cybele, including child sacrifice, occur. You will see that the Roman Catholic Church is the eighth head, which came out of the seven, so this reinforces that the Roman Catholic Church is Mystery Babylon. Revelation 17:10 There are also seven kings. Five have fallen, one is, and the other has not yet come. And when he comes, he must continue a short time. King in Strong’s can be translated as ‘sovereign’. Webster’s 1828 Dictionary defines ‘sovereign’ as “A supreme lord or ruler; one who possesses the highest authority.” So it’s pointing to 8 types of rulers in the Roman Empire, which John would be familiar with. At the time that John wrote Revelation, five forms of the Roman kingdom had come and gone; 1) Kings, 2) Consuls, 3) Dictators, 4) Decemvirs, and 5) Military Tribunes. The sixth form of the Roman government was the Imperial head, commencing with Octavian, better known as Augustus Caesar. This form of government existed in John’s day and was in power until the last Emperor was removed in 476 A.D.
During the ‘short space‘ until the 8th head would arrive; the seventh head of the Roman beast was the Dukedom of Rome. Renowned historian Edward Gibbons tells us that Italy was divided unequally between the kingdom of the Lombards and the Exarchate of Ravenna. John was being told that the Harlot described in verses 1-6, the Roman Catholic Church, would rise to power after the seven forms of government of the Roman Empire. The Popes of Rome were empowered by Eastern Emperor Justinian in 538 A.D., which was a ‘short space‘ after the last Roman Emperor was removed in 476 A.D. This is the same message that Paul gave in 2 Thessalonians 2, when he said that the Son of Perdition would rise to power when the ‘restrainer,’ the Roman Emperors, were removed. Remember, Paul and John had to hide their message, as they couldn’t write that the Roman Empire would be destroyed, as that would have invited more persecution from Rome. Revelation 17:11 And the beast that was, and is not, is himself also the eighth, and is of the seven, and is going to perdition. The Roman Catholic Church is the eighth, which came to power when the Roman Empire collapsed and the last Roman Emperor was removed in 476 A.D. The Popes took the title of Pontifex Maximus, the title of the Roman Emperors, which can be traced back in different forms to the ancient Babylon. The Babylonian Kings served as both king and priest of the pagan Babylonian Mystery religion. This fulfillment matches that of the Little Horn of Daniel 7. When the Roman Empire collapsed, it was split into 10 civil kingdoms. Then Satan empowered the Roman Catholic Church to rise to power in Rome, and the Popes caused three of the kingdoms, which would not bow down to their authority, to be removed, plucked out. This fulfillment also matches that of the Son of Perdition of 2 Thessalonians 2. As long as the Roman Emperors were in power, they restrained the Popes of Rome from having control. But when the last Roman Emperor was removed in 476 A.D., the Popes of Rome took power a short time later in 538 A.D.
New student, old soul here. In trying to understand the current geopolitical atmosphere and using my intuitive skills, I felt I must research the Book of Revelation. Thanks for your knowledge here. I started with REV 6 with the opening of the 7 Seals and the 4 Horsemen. When the White Horse appears from the First Seal, I believe the rider is the counterfeit version of Jesus… A fraud, the Anti-Christ. The rider of the Red Horse from the 2nd Seal, that will cause war, destruction and the invasion of Israel is likely a militaristic nation. Maybe Russia and her allies? From the 3rd Seal, we see The Black Horse – And the rider will cause great Famine. I believe this is the rise of global Communism. The destruction of the masses by imposing restrictions, oppressive laws, exorbitant prices and the theft of resources. Then The Lamb opened the 4th seal. We see The Pale Horse and his rider is Death. All terrible events in our future history. But what of the Beast, The Whore, The Anti-Christ, and The False prophet? Who could be this False Prophet? We’re told he will arrive softly and with great fanfare. He will be hailed as a great personage. I have scoured my tiny mind for answers and the only ‘personage’ that continues to haunt me is one Barack Obama. He has been President of the US, yet he is far from retirement. He still wants to wield power. The only structure that seems to fit his ambition would be the United Nations. If he is appointed to be Secretary-General, he could very well be the False Prophet. He would have his ‘Bow’, but without any ordinance. His power would be the ability to ‘influence’ and ‘corrupt’ rather than to defeat with war. He could set in motion the ‘time clock’ of the final 7 years by signing a covenant with Israel for her protection for the 7 years. And now the Anti-Christ. If he is to come from Europe, it will very likely be from the European Union(10 States – 10 Horns). Then there are the 7 heads or the 7 Kings. Five who have fallen, then one who is to come. ‘The one who is to come’ surely fits Prince Charles. Upon the passing of the Queen Of England, Charles will be the new King. I believe that with his history of having to ‘wait in the wings’ all these years, he will need a World-Wide stage to exhibit his wrath and demand we all pay homage. As for The Whore who rode upon the Great Dragon, I see the Catholic Church and the corruption of the Popes. They have taken their title as Pontifex Maximus, directly from the times of Babylon. They have committed fornication with all the heads of the great empires. This church is a tool of Satan to deceive the masses. And the Beast? The Great Deceiver? The Serpent? None other than Satan himself. Most of us will not be here for this ultimate destruction, but we still have the hope that as true believers, we will be taken to heaven and returned to an Earthly Paradise as it was before Original Sin. The seven kings and five are fallen are the last 5 Presidents that are still alive today. Carter, Bush, Clinton, Bush, Obama. These are the five fallen. The one is President Trump. The 7th is President Putin who is the beast of Rev.13:18 and the eighth is President Putin and the false prophet Pope Francis. Putin and Pope Francis both have the same number of the beast which is 313. The number of the beast is 313 and not 666. Must unveil the word number SIX HUNDRED THREESCORE AND SIX to get the hidden manna. God didn’t say the number is 666. God said the number is SIX HUNDRED THREESCORE AND SIX and to count it. In order to count the number we must assign a number to each letter in SIX HUNDRED THREESCORE AND SIX and add it up to get the number of the beast. Once we have the number then we match it to a man name. We use simple English gematria to assign a number to each letter in the alphabet. Pope Francis has the same number and is the false prophet. He became the Pope on 3-13-2013 which is the number of the beast 313. I’ll give you a ’10’ for originality Joey! Sadly, you get a ‘0’ for accuracy, as you’re explanation has no merit. Revelation is from the Apostle John’s perspective, so the five fell before John was given the Revelation, were the five previous forms of Roman government; the one that is, was the Roman Emperors who were removed from power in 476 A.D. The 7th was the 10 civil kingdoms of the fallen Roman Empire. And the 8th was the antichrist Popes of Rome, who were empowered as leader of church and state of Rome shortly afterward in 538 A.D.
Messiah does get all of the glory and credit, for the truth fulfillment of prophecy!!! The following is the correct explanation of the seven kings. This has not been veiled over the centuries; but has occurred in recent history. In the history of the U.S. presidency there have been three occasions when a president took office that five preceding presidents were still alive. The last time this happened was when Bush 43 took office. This makes Mr. Obama the seventh king. When Barack finished his first term, there was no doubt in my mind that he would be reelected (he must continue a short space). He will fall shortly. See Dan 11, last 2 verses and Dan 12, verse one. Well, that’s an interesting explanation Len. Revelation is pointing to the Popes of Rome who rose to power after the fall of the Roman Empire. To say that the Revelation 17 is about Obama is without merit. Now that really puts things into perspective. I’ve been heard and taught that the kings were literal kings ruling a coutry. Even so cone Lord, Jesus. The Empire of the Antichrist will be an Atheist Empire. Of course, Atheism itself is a very strictly followed religion. Now, follow the paper trail of atheist politicians and it will lead you to the High Priest, which will be a Jewish atheist homosexual who for now lives and rules in secret. The extraterrestrials hoax will be the deception which unites all belief systems and nationalities into a one world order. That’s when the worldwide persecution of Christians and nonconforming Jews will not just excellerate, but be mandated. The sales pitch will be that religion has been the cornerstone of All wars and human atrocities and we must put our religious beliefs aside and unite as one people. They will have the technology to reproduce nearly all biblical miracles and the whole world will marvel at their immense power and advanced technology, even opening up a portal to an alternate dimension which will bring the entire Satanic world into ours. That is what they are experimenting with at CERN. This portal is the bottomless pit in which they will return upon the detention of Christ, Who will rule for 1,000 years before allowing them to come through again to set the stage for the battle of Armageddon. Are there any scriptural references to what you have stated? The Bible’s says we shouldn’t be tossed about with every wind or doctrine. These teachings by Bro. David have been on point. That’s why we must be like Bereans and study to show ourselves approved unto God. The bible tells us to try the Spirit and see whether it’s of God or not. As a body of born again believers, many of us have been taught by leaders who don’t have the knowledge of the”True” word of God, therefore, they can’t teach what they don’t know(I’ve been under such leaders until God brought me out and the Holy Spirit began teaching me some of the issues facing the body of Christ) . But when God raises up someone who can help His people understand His word, we want to fight against it because we’ve been taught another gospel so long that the truth sounds like lies. Listen, I’m not coming down on you in no way. Just asking you to re-search the scriptures and allow God’s word to line up in truth in your heart. David This one I have not herd of. sound interesting. I have a few questions. you mention the 8th is the roman catholic church but you never mention who the 7th, 6th, 5th, 4th, 3rd 2nd and first are. if they are from pagan Babylon “golden head” would they have been part of the beast that was and is not. Do the 7-1 Kingdoms come from the Babylon Erra. your read-up also makes it sound that a hill will go into perdition. one other thing the woman “had” a cup in her hand full of abominations. she killed many Christians at a certain time and was well after the Babylon Erra can you explain how it goes back so far and not stay in the time of WAS. You really don’t pose mush of a refute to the argument proposed. 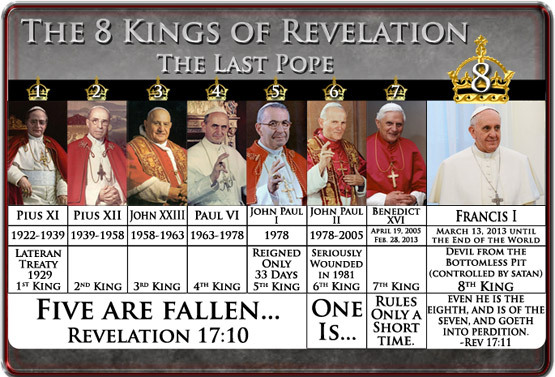 Seems the prophetic fulfillment of the 7 kings of Revelation 17 still points to the last Popes of Rome. You proposed No contrarian thesis. Well Willi, there is a world of different between it being 7 forms of government of the Roman Empire, which tells us that the 8th king, the antichrist Popes of Rome, have been the enemy of Messiah and His Church since the 6th century; as compared to it speaking only about the last eight Popes of our modern times, which seems to only point to the 8th Pope as the antichrist. The position of antichrist has been fulfilled by all of the Popes of Rome, who proclaim to be the Vicar of Christ. It is not just one man in the end times. Great article! I think I read somewhere that the 7 heads were Egypt, Assyria, Babylon, Medo-Persia, Greece, Rome and Ottomans and Vatican is the eight head because it came from Rome. Thank you for your great articles. Thank you for your comment 🙂 Yeah, I too had read the concept of the 7 heads being the previous kingdoms. Keep learning and growing in the faith! Oh and I’ve seen this theory on WLC before. I knew it was bogus because they claimed about three years ago that the 8th was John Paul II resurrected. That obviously didn’t take place and they had to publicize an apology.